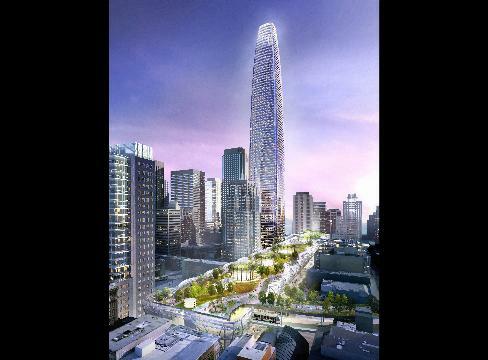 San Francisco's about to get a lot taller. The city recently approved a final design for a new skyscraper connected to a revamped transit center. At 1,200 feet tall, the (somewhat redundantly named) Transportation Transit Center will be, by far, the city's tallest building, vastly exceeding the Transamerica Pyramid, which stands at 853 feet. 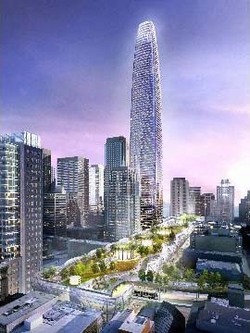 It's already being called the "Grand Central Station of the West," and the new tower, set for completion in 2014, will rival the Empire State Building in height. S.F. Mayor Gavin Newsom says it's "imperative" that San Francisco keep pace as super-tall skyscrapers are being built across the globe. I've only been to San Francisco once, last year. And God knows I'm no architect. But when I walked around the city, I was struck -- maybe even awestruck, and certainly in a good way -- about how unlike other cities S.F. seemed to be. To me, while I love the actual design of the new Transportation Transit Center, it will be a very stark contrast to everything that makes San Francisco as beautiful a city as it is. I'm certainly not against progress or change in a city's skyline, but this new building seems like an especially big leap -- one that, in my opinion, could hurt the character of the city more than help it.